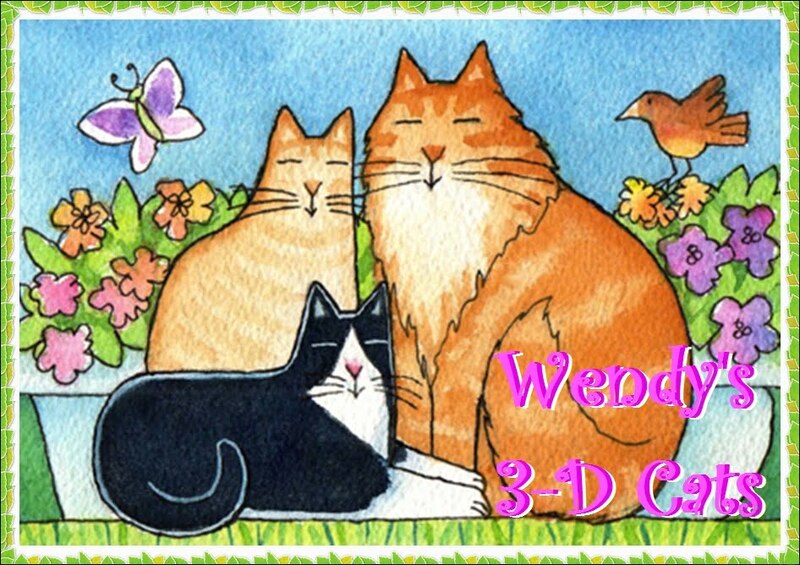 Wendy's 3-D Cats: DOMINO: THE HOSTESS WITH THE MOSTEST! I have been quite busy lately, cooking and cleaning in preparation for a birthday dinner for two of my friends. And I have another birthday dinner party for my brother this coming Sunday. I just love to entertain, but it's a lot of work and leaves little time for other things like blogging. However, today I'm allowing myself a break to report on the first party before getting started on the second. Domino always dresses for these occasions and performs her hostessing duties beautifully. She greets the guests, and basically worms her way into their hearts and onto their laps. She provides a lot of joy by her sheer presence. Dante was also in attendance and performs backup duty when required. He's the valiant valet. When it comes time to eat, however, Domino knows a good hostess leaves the guests alone to enjoy their food without interference, and leaves the waiting to the waiter. "Today I is warin' mai speshul Oryental hostess jackit", says Domino. "It makes me feel so bootiful!". "Dis is our furst guest, Renate. We is celebratin' her birfday tonite. I makes shur dat da waitah (dat's mai Daddy) brings Renate a glass of bubbly wine. An' I gets pattted on da head fur mai effurts!" Next Domino is invited to join Renate for a little lap time. And she happily laps it right up! When the doorbell rings again, brother Dante serves as BACK UP, as Domino is otherwise occupied. Why, it's Val! Our other birthday girl! The two ladies of honour share a hug. Ever so silently and efficiently, Domino has attended to Val's needs by ordering her up some wine, too! Next the ladies open their gifts. Domino is standing sitting by in case they need any help with shredding the paper. But, they seem to do just fine on their own. "Save the wibbons fur me, pleez", asks Domino. Ribbons always make for a good snack. Renate was simply bowled over by her gift! And as you can clearly see, Domino has taken care of all of Renate's KNEEds. Domino announces "Dinnah is served!" The birthday girls sit down to their first course -- homemade French Onion soup -- with lots of cheese! It's remiss of me to not introduce our third guest until now. She is our friend and neighbour, Susan who is part of the ladies quartet that regularly breakfast and celebrate birthdays together. Just look at the lovely spring flowers, too! They make the table look so festive. Then the main course is served. It is rolled veal, stuffed with ham, spinach, mushrooms and cheese, covered in red wine sauce. The sides are smashed red potatoes and glazed brussel sprouts with carrots. All of the ladies really enjoyed it! You may have noticed little gift bags at each place setting. Inside was a little gift for each lady -- a painted egg in a brass stand. You can see Renate's green egg in the previous picture. Susan got a pink one, and Val a blue one. I also included four jokes and a couple of chocolates in each bag. Of course, I wrote the jokes myself -- and as you can possibly guess, each one was a pun. The ladies had fun (but no success) trying to guess every one. After the main course everyone was too full for the cake, so we waited until after the movie (we watched "The Switch" with Jennifer Aniston and Jason Bateman) to serve it. Dante keeps Val company waiting for the cake to arrive. He can hear the sparklers sizzling! As the waiter (Daddy) presents the cake, the two birthday girls greet each other. We sing "Happy Birthday" to Renate and Val. They cut the cake and take it home. They were still too full from supper. And then it was time to say goodnight, so they could get home quick before the cake (Baskin Robbins ice cream cake) melted. Goodbye!, says Domino. "We hopes to see yoo again, sometime soon." She watches as their headlights disappear into the darkness. It looks like a great time was had by all! The dinner looks delicious and Domino and Dante are fantastic hosts! You guys are great hosts. Love the cake and Domino's jacket. What a fun evening! Domino, your outfit was stunning. And Mommy wants to eat at YOUR house--we'd like some ice cream cake, please! What a fantastic dress Domino! You were great hosts! What a fabulous celebration! Of course Domino in her gorgeous hostess jacket made the entire evening! The mom says she has a birthday coming up soon...maybe you'd like to cook for her too. Haha! Your home is beautiful and all of your special little touches I am sure were deeply appreciated by the birthday girls!!!! Just wonderful! Ok...now...the impawtant part...where in the world did you EVER find a kimono for Domino????? OMG I was just dying!!! She certainly took her hostessing duties seriously! Miss Domino, you are the perfect hostess! Wow, Domino, birthday parties are a LOT of work! You put a lot of effort into this one. Oh yeah, what was it your human did, btw? Looks like a wonderful time! Domino looked extra pretty in her finery! What a fabulous time yoo all had. Dommy yoo look so beautiful in yoor oriental owtfit. 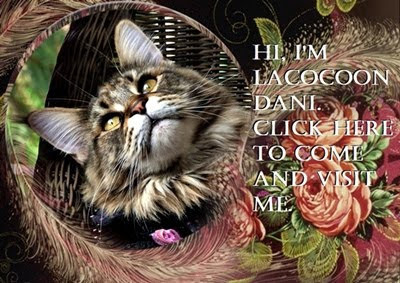 Yoo are the PURRfect hostess. Wow, what a fabulous party!! Domino was just the purrfect hostess, and I adore her fancy jacket! She looked beautiful, as usual! Domino in her kimono is a PURRfect hostess! YUM... will you look at that lovely dinner and all those gifts! What fun! I'm sure an excellent time was had by all... FURBY would like to know where his invitation was on his BD? LOL!